Nivea Lip Butters (check availability here) - $3 approx. - Smooth Kiss - which I am assuming is unflavored/unscented. - Raspberry Rose Kiss - which from the reviews I have read is apparently the best. - Vanilla & Macadamia Kiss which I was this close to picking up. - Caramel Cream Kiss that I happily bought. All 4 tins seemed to have the same ingredient list, and with my new-found desire to limit unnecessary shopping, I decided to try only one and picked up the Nivea Lip Butter in Caramel Cream Kiss. The tin packaging is similar to Burt's Bees Lip Balm tins (bigger than the Vicks tins back home in India), a little larger and flatter making them perfect to slip into pockets. The Nivea Lip Butter in Caramel Kiss is a yummy-smelling, buttery, creamy balm that smells like a mixture of caramel popcorn and Haagen-Dazs Dulce de Leche. Weird combination if you were to eat that, but the smell is just perfect if you are a fan of caramel. With an ingredients list featuring a mix of petrolatum and moisturizing, skin-softening ingredients like shea butter and almond oil, the Nivea Lip Butter in Caramel Cream Kiss is a treat for dry (or normal) lips. The texture is quite soft and not too greasy or sticky, and it does a good job of keeping my lips soft. The only fault I can find with this is the smell makes me really, realllly hungry! 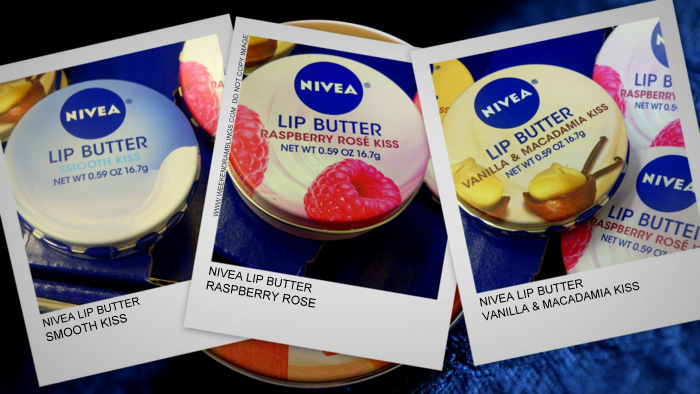 Here's a look at the other 3 Nivea Lip Butters - Raspberry Rose Kiss, Smooth Kiss, and Vanilla and Macadamia Kiss. Nivea Lip Butter tins seem to retail online for about $3, but I found these on sale at about $1 :D I cannot wait to finish Caramel Kiss (and the other million lip balms I have lying around the house) and pick up the Raspberry Rose Kiss next - every review I read says that's the best. Are you a caramel lover? why didn't you pick the Raspberry one? LOVEEEEEEEEEEEEEEEE caramel :D :D I thought the Raspberry one might be one of those artificial berry-flavored ones that is too strongly scented...but I read the reviews after buying and everyone says it's quite nice. :D :D :D Thank you!!! Ur talk of Haagen-Dazs got me craving ice creams...I'll make do with chocolate for now (pops a Lindt Lindor in the mouth).